Dozens of Chicago area new car dealers are on a mission to support the local troops and their families in summer style. 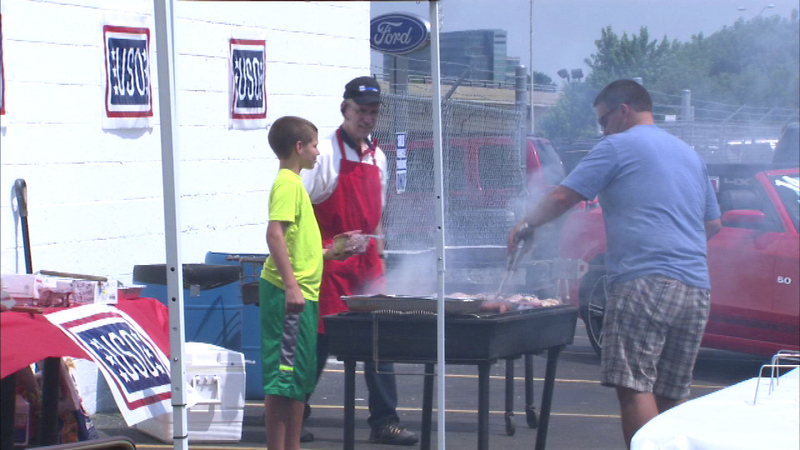 CHICAGO (WLS) -- This weekend, 100 car dealerships from across the area will fire up their grills to raise money for the USO of Illinois. You don't need to be in the market for a car to enjoy the cook-offs, live music and games at these fundraisers. This marks the fifth year for the Barbecue for the Troops initiative. It has raised almost half a million dollars so far and the goal is to raise a whole lot more this weekend. The funds go to support local military members and their families. You can expect patriotic ceremonies, lots of delicious food, activities for kids and car washes. In addition to Saturday's fun, participating dealerships are accepting donations at their service centers throughout the month of July. Visit drivechicago.com to find a participating dealership near you. You'll also find information about a social media contest where you can nominate someone deserving of the ultimate backyard barbecue. It's a party for fifty friends and a special visit from the Chicago Blackhawks. Barbecue for the Troops runs Sunday from about 11 a.m. to 2 p.m., though the hours can vary by dealership and donations will be accepted through the entire month of July.